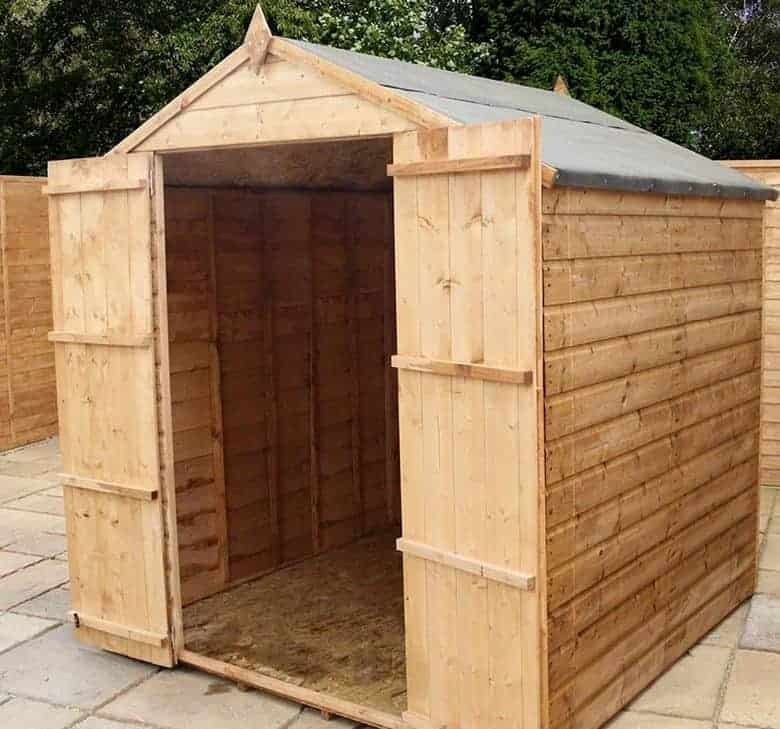 This quaint little shed is built from high quality Shiplap tongue and groove cladding. Dip treated prior to delivery, the timber has a great weather-resistant coating that enables you to skip the first year’s treatment if you want to. However, it is advised that you use the free tub of treatment supplied for pure reassurance. Double ledge doors provide easy access and they come with a turn button fastening. They have even been factory fitted so you won’t need to worry about them during assembly. The apex roof ensures you have a great amount of headroom inside the building, making it easier and more comfortable to use. As there aren’t any windows, you benefit from a very private shed and it also gives the building a more rigid look. A basic roof felt is provided, but it could be worth upgrading to a better felt. The floor could also use an upgrade as the solid sheet will struggle with the weight of heavier tools. A 10 year anti rot and fungus guarantee is supplied, giving you total peace of mind. As this is built with value in mind, it doesn’t come with a large range of features. Therefore it would best suit those looking for a simple storage space. Weak solid sheet floor isn’t suitable for large, bulky and heavy storage. You could spend extra money strengthening the floor yourself, but mainly it’s suitable for light storage. This Windsor shed benefits from great height thanks to the chic apex roof. It comes with an almost identical width and depth and offers an excellent amount of space for your storage. It would make a good size workshop if the floor was stronger, but you will need to strengthen the solid sheet materials if this is what you plan to use it for. It benefits from wider than average doors, though the height is standard at 5’6”. Step inside the shed and you’ll instantly see it is created with solid sheet materials. The ones used on this particular shed have a very low quality look. The good news is the floor will be able to hold mid-weight equipment without buckling under the pressure, although we still recommend adding more stability and strength where you can. 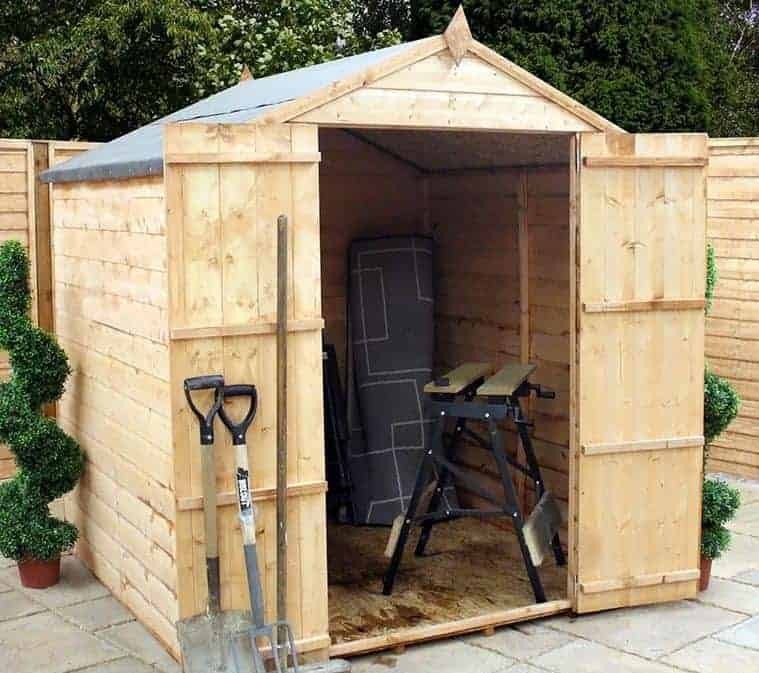 This would require some DIY skills however so mainly we’d recommend this shed to those with very basic, light gardening equipment. An apex roof provides the main focal point on this building and it increases the interior height significantly. 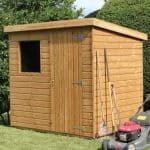 Whilst taller people may need to duck a little to get inside, once in the shed you will have more than enough height to comfortably move around. It is protected by a light coloured felt which looks good, but won’t provide long-lasting protection. So we’d also recommend upgrading this before assembly. 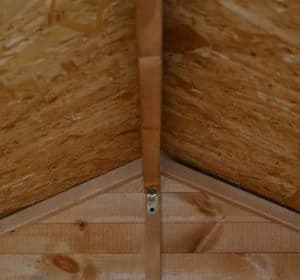 Shiplap tongue and groove is used for the walls of the shed. With a practical groove built in-between each panel, it allows for much more effective rainwater resistance than overlap. 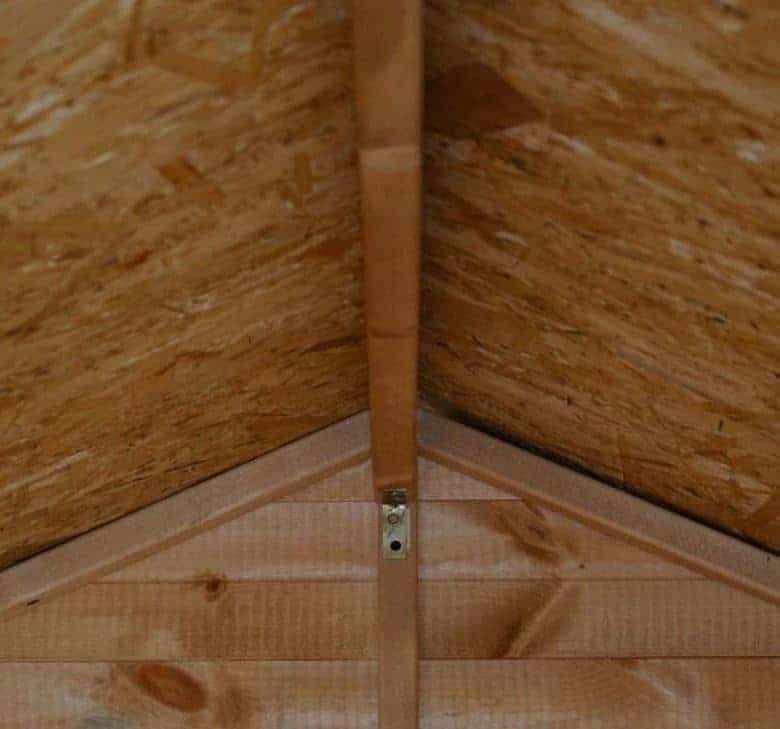 The tongue and groove gives an incredibly effective interlocking design which also allows fewer drafts into the building. Whilst many sheds come with Shiplap tongue and groove cladding, this one is made from lighter timber, giving it a more chic design. Inside you’ll find a standard 28m x 28mm frame. Before being delivered, the timber is dip treated, which is a unique four stage process. It isn’t as strong as a pressure treatment, but it does mean you don’t necessarily have to apply another treatment right after installation. We would suggest adding a treatment no more than 3 months after assembly and then annually thereafter. Following this advice will ensure you benefit from the 10 year anti rot warranty. 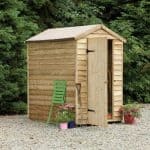 The shed comes with double doors that open out to reveal a spacious 3’2” width. This means you’ll easily get any type of storage through the doors no matter how bulky or awkwardly shaped they might be. The quality of the doors could be better however. They are not braced so there is a chance they could start to sag through heavy use. However, one unique advantage of this shed is the fact that the doors come already fitted. This makes assembly both easier and faster which is always an advantage. There is a turn button catch to keep the doors secure, but not locked. Zero windows are added to the building so there won’t be any natural light and you won’t be able to ventilate the building other than leaving the door open in warmer weather. However, it does provide a more solid construction. 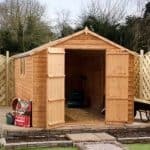 The shed comes with low security so this is something you will need to improve if your garden is open to the public or easy to access. As there isn’t a hasp and staple or pad bolt, adding a lock is a little trickier than it would be with some competitor sheds. We’d advise adding a hasp and staple and a high quality alarm system for maximum thief protection. You can’t get a more private building thanks to the solid, windowless design. This is great news if you are looking at storing valuable tools. Though do make sure you improve security before keeping anything expensive in here. 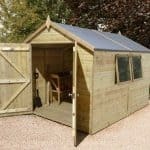 The Shed Store presents you with three extra options with this shed. The first is an installation service. Now for the price of this service we really don’t feel this is necessary. 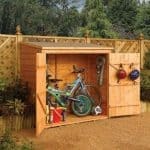 Many sheds are difficult to assemble, but this one is specifically designed with easy assembly in mind. For example, it already comes with factory fitted doors. So erecting the building should be fairly straightforward. The DIY Assembly Assistance Tool Kit may be a little more useful however. Whilst the shed does come with all fixings, felt and instructions, it doesn’t actually come with the tools you might need to assemble it. This great kit comes with such a wide variety of tools that can be used not just with this building, but with any you buy in the future too. For example, you’ll find a 16 inch saw, a hammer, safety goggles and gloves, spirit levels, brushes and a knife to cut open packaging. Finally there’s a selection of four different coloured treatments, Now the shed does come with a free treatment already so technically you don’t have to buy another one for at least a year. However, you may want to at least check out the different colour options. Our favourites are Red Cedar and Ivy Green, though there’s also a very traditional light brown or a more sophisticated dark brown colour available. 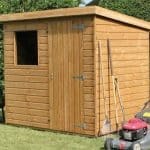 It is unusual to find a shed that offers such high quality cladding in this budget range. The exterior of the shed is definitely made to a high standard. However, it is a budget shed and that does mean parts of the building suffer with a lower quality design. The exterior cladding definitely enhances the shed’s durability, but overall compared to competitor models this does have a few drawbacks. Provided you follow the manufacturer’s advice on treatments and you don’t store anything heavy in the shed, it should last for quite a few years to come. On the picture you can’t really tell how much space you are getting. It offers a fairly large amount of depth and width, allowing the storage of various types of tools and equipment. There are some disadvantages to this shed but the installation isn’t one of them. This is one of the easiest Windsor sheds to put together thanks to the pre-fitted double doors. There also aren’t any windows to worry about and the instructions given are pretty detailed. 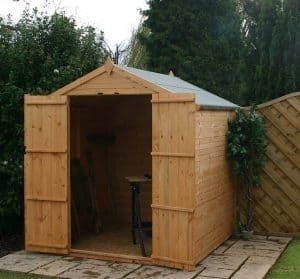 Compared to many other budget sheds, this one does give you a lot for your money. The upgrades needed aren’t expensive and the level of space available for storage is fantastic. Final Thoughts: We like the no frills approach of this shed. You’ll notice the cost is slightly higher than some similar sized competitor sheds and that’s because of the great quality Shiplap cladding. Whilst it doesn’t offer a massive range of features, it does still come with many benefits. The windowless design gives you privacy to store valuable bicycles and gardening equipment. There isn’t any security on the building besides the thick cladding however, so you will need to buy a padlock to keep your storage safe. The fact the manufacturers have dip treated the shed and you are supplied a free tub of treatment is also a fantastic benefit.